Home › Red-necked falcon › Common kestrel - Falco tinnunculus. The common kestrel (Falco tinnunculus) belongs to the family Falconidae. These common kestrel species are distributed in Indian Subcontinent, Europe, Asia and Africa. Falco tinnunculus is closely related to F. newtoni, F. punctatus, F. araeus, F. moluccensis, F. cenchroides and F. sparverius. The twelve recognized subspecies are: F. t. tinnunculus Linnaeus, 1758, F. t. perpallidus (A. H. Clark, 1907), F. t. interstinctus McClelland, 1840, F. t. objurgatus (E. C. S. Baker, 1927), F. t. canariensis (Koenig, 1890), F. t. dacotiae E. J. O. Hartert, 1913, F. t. neglectus Schlegel, 1873, F. t. alexandri Bourne, 1955, F. t. rupicolaeformis (C. L. Brehm, 1855), F. t. archeri E. J. O. Hartert & Neumann, 1932, F. t. rufescens Swainson, 1837 and F. t. rupicolus Daudin, 1800. The common kestrel is a small bird of prey, measuring 25 to 35 cm in length and weighing 135 to 250 grams. The female bird is slightly larger and weighs 155 to 310 grams. The wingspan is 55 to 80 cm. The head and tail are grey in male kestrel. The rest of the plumage is mainly light chestnut brown with blackish spots on the upperside and brown with narrow blackish streaks on the underside. The cere, feet and the narrow ring around the eye in these kestrel species are bright yellow. The toenails, bill and iris are greyish black. The kestrel call is a fast, shrill kik-kik-kik-kik sound. 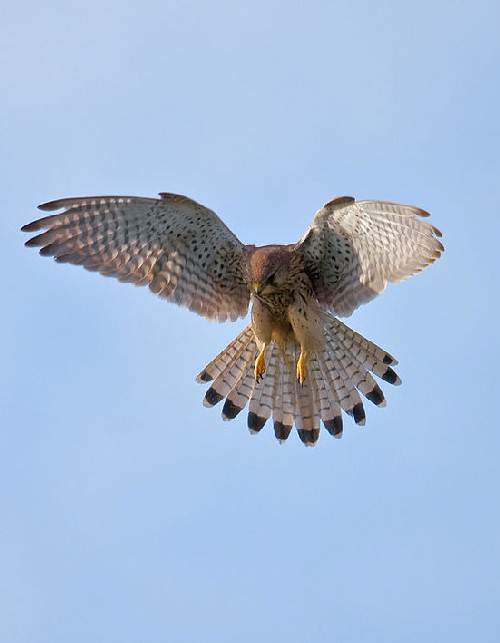 The common kestrel species inhabit fields, heaths, shrubland, wetlands, moorlands, arid savanna and marshland. The common kestrel mainly feed on small mammals, particularly voles and other rodents. They also prey on small birds. The breeding season of these kestrel species varies depending upon the climate in their range. They nest in holes in cliffs, trees or buildings. The clutch normally contains three to six eggs. The female incubates the eggs. The male hunts and feeds the incubating female. 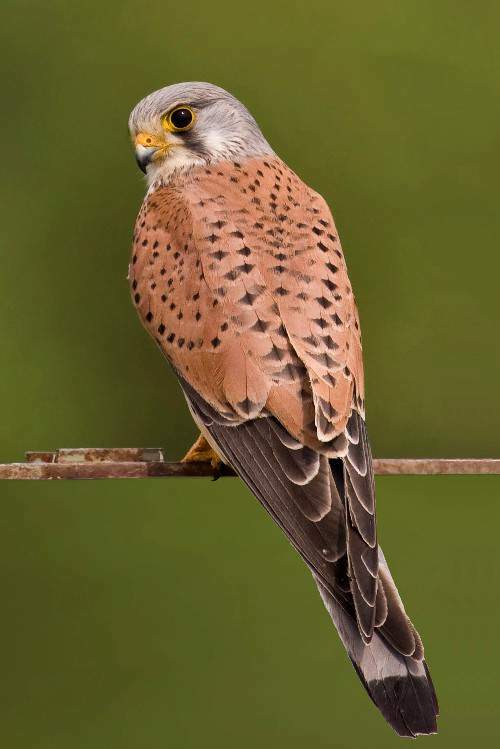 The common kestrel subspecies F. t. tinnunculus is distributed in Africa, Europe, Siberia, Middle East, Afghanistan, Pakistan, India, Nepal, Bhutan and Southeast Asia. The subspecies F. t. perpallidus is distributed in Siberia, Korea and China and winters in Southeast Asia. The kestrel subspecies F. t. interstinctus occurs in China and Japan. It winters in India, Malay Peninsula, Philippines and Indonesia. The subspecies F. t. objurgatus is distributed in South India and Sri Lanka. The subspecies F. t. canariensis occurs in Madeira and Canary Islands. The common kestrel subspecies F. t. dacotiae is distributed in Canary Islands. The subspecies F. t. neglectus and F. t. alexandri are distributed in Cape Verde Islands. The subspecies F. t. rupicolaeformis occurs in Africa and Arabia. The kestrel subspecies F. t. archeri is distributed in Somalia and Kenya. The subspecies F. t. rufescens occurs in western and central Africa. The common kestrel subspecies F. t. rupicolus is distributed in Angola, Congo, Tanzania and South Africa. The common kestrel populations in the northern ranges are migratory moving southwards for wintering. The populations in the warmer areas are mainly sedentary. The common kestrel global population is estimated to be between 4,310,000 to 6,370,000 mature individual birds. Habitat degradation, felling of trees, overgrazing, agricultural expansion, windmills and dearth of prey are the main threats to the survival of these species of birds. The IUCN (International Union for Conservation of Nature) has categorized and evaluated these kestrel species and has listed them as of "Least Concern". Current topic in Birds of India: Common kestrel - Falco tinnunculus. Home › Amur falcon › Red-necked falcon - Falco chicquera. The red-necked falcon (Falco chicquera) belongs to the family Falconidae. These red-necked falcon species are distributed in Indian Subcontinent and Iran. Falco chicquera is closely related to F. ruficollis. It was earlier treated as conspecific with F. ruficollis. The red-necked falcon is a small bird of prey, measuring 30 to 35 cm in length and weighing 160 grams. The female falcon is larger and weighs 250 grams. The wingspan is 55 to 70 cm. It has a bright rufous crown and nape. The wings and upper parts are bluish grey. The legs, ceres and eye ring are yellow. The tip of the bill is black. The wing is short and pointed. The tail is long and rounded. Their call is a shrill kee..kee.. sound. These species of birds inhabit trees around open grounds, waterways, savannah, dry open country and semi-deserts. These falcon species feeds on small birds like sparrows, starlings and pigeons. Their breeding season in India is during January to March. Usually old tree nests of other birds are used. The clutch may contain three to five eggs. These falcon species are distributed in the Indian subcontinent and Southeast Iran. The red-necked falcon are mostly resident and nomadic in certain areas like Northeast India. The red-necked falcon population is undergoing decline. Habitat destruction and dearth in prey supply are the main threats to the survival of these bird species. The IUCN (International Union for Conservation of Nature) has categorized and evaluated these falcon species and has listed them as "Near Threatened". Current topic in Birds of India: Red-necked falcon - Falco chicquera. Home › Merlin › Amur falcon - Falco amurensis. The Amur falcon (Falco amurensis) belongs to the family Falconidae. These Amur falcon species are distributed in India, Africa and Northeast Asia. Falco amurensis is closely related to F. vespertinus. The Amur falcon is a small raptor, measuring 25 to 30 cm in length and weighing 100 to 155 grams. The female falcon is slightly larger and weighs 110 to 190 grams. The males have dark sooty grey back. The thighs, vent and undertail coverts are reddish brown. The female is paler, having dark scaly markings on white underparts. The eye ring, cere and legs are orange in color. Their call is a fast repeated kee..keee.. sound. The Amur falcon species inhabit open woods and marshes during the breeding season. Migrating birds roost and stay near open forests. These falcon species feed on insects, capturing them in the air or on the ground. They are known to feed on small birds and frogs. During their migration, it is believed that their diet mainly consists of migrating dragonflies. The Amur falcon breeding season is between May and June. Abandoned nest platforms belonging to other birds and tree hollows are used for nesting. The clutch may contain three to four eggs. Both the parents take part in incubating eggs and feeding chicks. The breeding populations of these birds are distributed in Southeast Siberia and Amurland in Russia, northeastern Mongolia, northeastern China and North Korea. They migrate to southeastern Africa in winter. They make a stop over in Nagaland (northeastern India). The Amur falcons breed in northeastern Asia, including Southeast Siberia, Mongolia, China and North Korea. During their wintering migration to southern Africa these falcons exhibit flocking behaviour. They make a stop over in Northeast India, especially the Nagaland State. 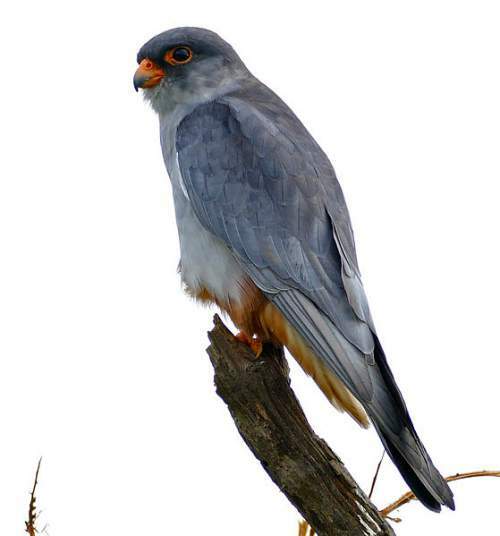 In 2012, mass trapping and capture of migrating Amur falcons occurred in Nagaland (India). The falcon global population is estimated to number more than 1,000,000 individual birds. These species of birds have an extremely large range and are considered least vulnerable. Mass trapping, capturing and slaughtering of migrating and roosting flocks is the main threat to the survival of these species of birds. The IUCN (International Union for Conservation of Nature) has categorized and evaluated these falcon species and has listed them as of "Least Concern". 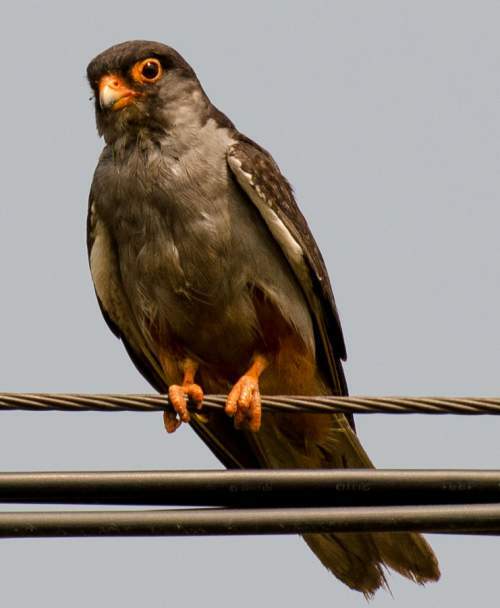 Current topic in Birds of India: Amur falcon - Falco amurensis. Home › Eurasian hobby › Merlin - Falco columbarius. The merlin (Falco columbarius) belongs to the family Falconidae. These merlin species are distributed in Indian subcontinent, Europe, Africa, Asia, North America, south America and southeast Asia. Falco columbarius is closely related to F. chicquera. The nine recognized subspecies are: F. c. subaesalon C. L. Brehm, 1827, F. c. aesalon Tunstall, 1771, F. c. insignis (A. H. Clark, 1907), F. c. pacificus (Stegmann, 1929), F. c. pallidus (Sushkin, 1900), F. c. lymani Bangs, 1913, F. c. suckleyi Ridgway, 1874, F. c. columbarius Linnaeus, 1758 and F. c. richardsonii Ridgway, 1871. The merlin is a small bird of prey, measuring 25 to 35 cm in length and weighing 150 to 200 grams. The female marlin is larger and weighs 190 to 260 grams. The wingspan is 50 to 70 cm. Merlin is robust and heavily built falcon. The male has a blue-grey back and buff- to orange-tinted underparts. The tail has wide blackish bands. The eye and beak are dark and the cere is yellow. The feet are also yellow, with black claws. Its call is a chain of kee..kee.. sound. The merlin habitat is extremely varied. They are found in sea levels as well as high mountains. Merlins inhabit scrubs, shrubland, taiga forest, parks, grasslands, steppe and prairies. The merlin feeds on small birds ( larks, pipits, house sparrows, sandpipers, flickers and rock pigeons) reptiles, bats, voles and large insects. The merlin breeding season is during March to June. They mostly use abandoned nests of other birds with dense vegetative or rocky cover. The clutch may contain four to five eggs. Most of the incubation is done by the female and the male hunts and feeds the family. 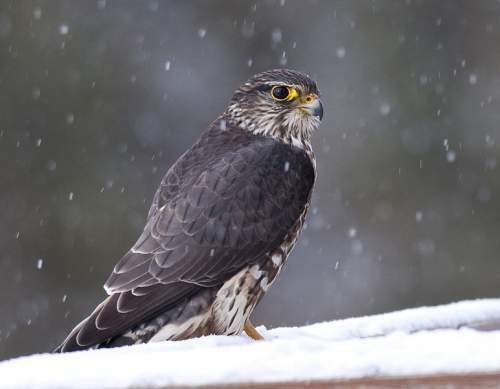 The merlin subspecies F. c. subaesalon is distributed in Iceland. The subspecies F. c. aesalon distributed in northern Europe and northern Asia. The subspecies F. c. insignis distributed in eastern Siberia. The subspecies F. c. pacificus distributed in Far East Russia. The merlin subspecies F. c. pallidus distributed in steppes of Central Asia. The subspecies F. c. lymani distributed in mountains of Central Asia and Mongolia. The subspecies F. c. suckleyi distributed in Pacific coast of North America. The subspecies F. c. columbarius distributed in North America including Alaska and Central Canada. The merlin subspecies F. c. richardsonii distributed in plains of North America. The merlin species are mostly migratory and the northern populations move southwards for wintering. The global population of merlin is estimated to number more than 1,300,000 individual birds. These species have an extremely large range and are considered least vulnerable. There is significant increase in merlin population. The IUCN (International Union for Conservation of Nature) has categorized and evaluated these merlin species and has listed them as of "Least Concern". Current topic in Birds of India: Merlin - Falco columbarius. Home › Oriental hobby › Eurasian hobby - Falco subbuteo. The Eurasian hobby (Falco subbuteo) belongs to the family Falconidae. These Eurasian hobby species are distributed in Indian subcontinent, Europe, Africa, Asia, Indochina and southeast Asia. Falco subbuteo is closely related to F. cuvierii, F. severus and F. longipennis. The two recognized subspecies are: F. s. subbuteo Linnaeus, 1758 and F. s. streichi E. J. O. Hartert & Neumann, 1907. The Eurasian hobby is a small bird of prey, measuring 30 to 35 cm and weighing 130 to 230 grams. The female hobby is much larger and weighs 140 to 340 grams. The wingspan is 70 to 85 cm. It has slate-grey back and a dark crown. It has two short black moustachial stripes. The throat is white and thighs and undertail coverts are rufous. The underparts are white with black streaks. Its call is a plaintive sound. These hobby species inhabit open wooded country, farmland, marshes and savanna with trees on the fringe. The Eurasian hobby species feed on large insects like dragonflies, beetles, moths, grasshoppers and locusts. They may also prey upon small birds and bats. 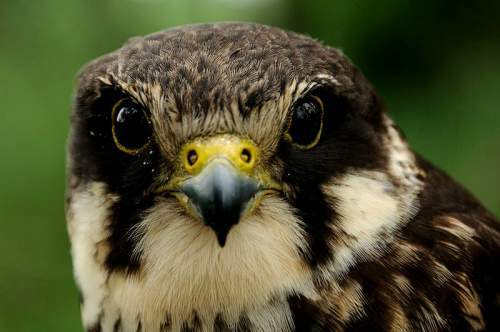 The Eurasian hobby breeding season is during June and July. They nest on trees, using the abandoned nests of other birds. The clutch contains two to four eggs. Both the parents take part in incubating and raising the chicks. The subspecies F. s. subbuteo is distributed in Indian subcontinent, Europe, Africa, Asia and southeast Asia. The subspecies F. s. streichi is distributed in China, Indochina and Myanmar. The Eurasian hobby are mostly migratory, the European birds move to Africa for wintering whereas the Asian birds move to Indian subcontinent and southeast Asia. The wintering migration occurs during August and October and the return to the breeding grounds is during March and April. The Eurasian hobby global population is estimated to number about 400,000 individual birds. These species of hobby have extremely large range and are considered least vulnerable. The destruction of forest habitats, human disturbance, hunting and wind energy structures are the major threats to the survival of these species of hobby. The IUCN (International Union for Conservation of Nature) has categorized and evaluated these hobby species and has listed them as of "Least Concern". Current topic in Birds of India: Eurasian hobby - Falco subbuteo. Home › Laggar falcon › Oriental hobby - Falco severus. 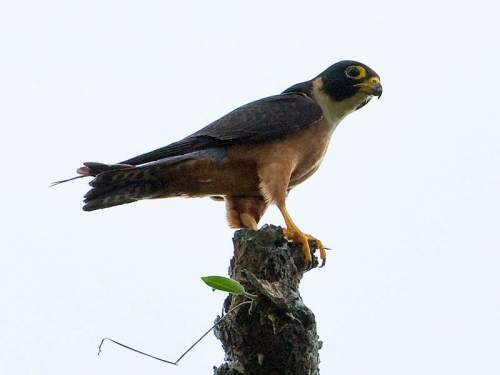 The Oriental hobby (Falco severus) belongs to the family Falconidae. These Oriental hobby species are distributed in India, Nepal, China, Myanmar, Thailand, Indochina, Indonesia, Philippines, New Guinea, Solomon Island, Bangladesh and Sri Lanka. Falco severus is closely related to F. longipennis. The two recognized subspecies are: F. s. severus Horsfield, 1821 and F. s. papuanus Meyer & Wiglesworth, 1893. The Oriental hobby is a small bird of prey, measuring 25 to 30 cm in length and weighing 170 to 250 grams. The wingspan is 60 to 70 cm. These hobby species have a black hood and pale throat. They have bluish-grey back and rufous underparts. The tail is short and the wings reach up to the tail tip. The legs are yellow. Their call is a repeated “kee-kee" sound. The Oriental hobby species inhabit forest clearings, lowland forests, mangroves and foothill forests. The Oriental hobby species feed mainly on insects. They have been observed to prey on small birds and bats. The Oriental hobby nests on the stick nests of other birds in trees, building ledges or on cliffs. The breeding season is from April to July in India. The subspecies F. s. severus is distributed in India, Sri Lanka, Nepal, Bangladesh, China, Myanmar, Thailand, Indochina, Indonesia and Philippines. The subspecies F. s. papuanus is distributed in New Guinea, Bismarck Archipelago and Solomon Island. The Himalayan hobby are migratory and move southwards to south India and Sri Lanka for wintering. Other hobby populations appear to be sedentary. The Oriental hobby population is estimated to number 1,000-10,000 individual birds. These hobby species have extremely large range and are considered least vulnerable. Deforestation and habitat loss are the main threats to the survival of these falcon species. Current topic in Birds of India: Oriental hobby - Falco severus. Home › Saker falcon › Laggar falcon - Falco jugger. The laggar falcon (Falco jugger) belongs to the family Falconidae. These laggar falcon species are distributed in India, Iran, Afghanistan, Pakistan, Nepal, Bhutan, Bangladesh and Myanmar. Falco jugger is closely related to F. biarmicus, F. cherrug and F. rusticolus. The laggar falcon is a medium sized bird of prey, measuring 40 to 45 cm in length and weighing 500 to 850 grams. The wingspan is 90 to 110 cm. These birds have dark plumage on the back. The face, cheeks and throat are pale. The chest is striated. They appear slender with long wings and tail. Their call is a loud "we-ee-ee" sound. These species of birds inhabit arid open areas, dry woodland, cultivated areas and open country with scattered trees near human habitations. These falcon species feed mostly on birds, especially game birds and passerines. They also feed on small mammals and lizards. The laggar falcon breeding season is from January to May. They have been observed to use the stick nest of other birds and tree holes. The clutch consists of three to five eggs. These falcon species are distributed in India, Iran, Afghanistan, Pakistan, Nepal, Bhutan, Bangladesh and Myanmar. They are conspicuously absent in south India. These falcon species are resident birds and are sedentary. They move around their range while foraging. The laggar falcon global population was estimated at 15,000 to 30,000 individual birds. There is rapid decline in the population and these species of falcons are considered near threatened. The spread of agriculture and use of pesticides, trapping and capture for falconry and habitat destruction are the main threats to the survival of these species of birds. Current topic in Birds of India: Laggar falcon - Falco jugger. Home › Peregrine falcon › Saker falcon - Falco cherrug. The saker falcon (Falco cherrug) belongs to the family Falconidae. These saker falcon species are distributed in Indian subcontinent, Asia, north Africa and Europe. Falco cherrug is closely related to F. rusticolus, F. biarmicus and F. jugger. The four recognized subspecies are: F. c. cherrug J. E. Gray, 1834, F. c. milvipes Jerdon, 1871, F. c. coatesi Dementiev, 1945 and F. c. hendersoni A. O. Hume, 1871. The saker falcon is a medium sized bird of prey, measuring 45 to 60 cm in length and weighing 700 to 1,000 grams. The female saker falcon is much larger and weighs 1,000 to 1,300 grams. The wingspan is 100 to 130 cm. They have brown upper bellies and pale brown head and underparts. There is dark streaking on the breast. The crown is whitish to brown. Their call is a loud kyak-kyak or kiy-ee sound. The saker falcon inhabits open grassy landscapes, desert edge, semi-desert, plains near waterbodies, steppes and arid mountain areas. 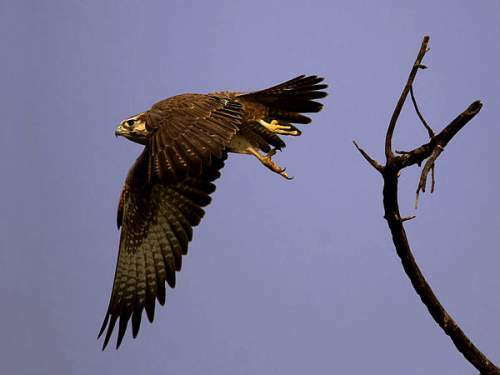 The saker falcon species hunt terrestrial rodents by flying close to the ground in open terrain. They are also prey on birds and reptiles. The breeding season is during April and May. They nest on cliff ledge and tall trees. They may use abandoned stick nests of other birds. The clutch may consist of three to five eggs. The saker falcon subspecies F. c. cherrug is distributed in Europe, Asia, Southwest Asia, Middle East region and north Africa. The subspecies F. c. milvipes is distributed in Mongolia, China and north India and Nepal. The subspecies F. c. coatesi is distributed in Uzbekistan and Kazakhstan. The subspecies F. c. hendersoni is distributed in Pamir mountains to Tibetan Plateau. The saker falcons in temperate regions are migratory, moving southwards during the winter. They generally leave their breeding grounds in September and October and return between February and May. Birds in warmer ranges are mostly sedentary. The saker falcon population is undergoing a very rapid decline and these species of falcon are considered endangered. The global population is estimated to number 12,800 to 30,800 mature individual birds. 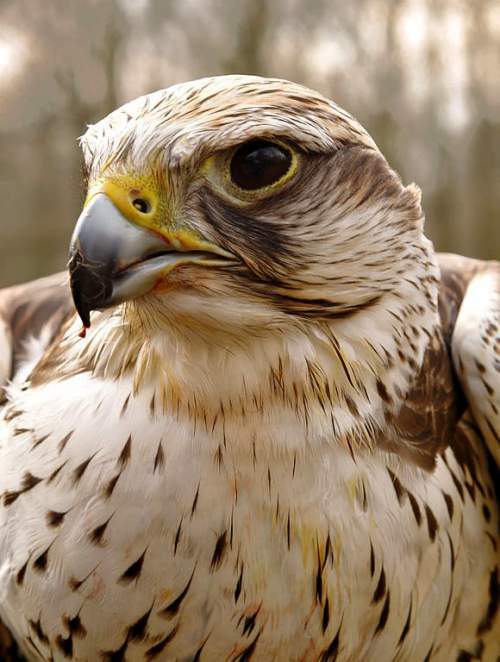 Saker falcons are known to be very susceptible to avian influenza. Capture for the falconry trade, habitat degradation, agricultural intensification, pesticide and agrochemicals use are the main threats to the survival of these species of falcons. The IUCN (International Union for Conservation of Nature) has categorized and evaluated these falcon species and has listed them as of "Endangered". Current topic in Birds of India: Saker falcon - Falco cherrug.